The band of our Milky Way galaxy can be seen along with planet Venus over light-polluted skies above Singapore in this image taken by astrophotographer Justin Ng on Feb. 28, 2014. 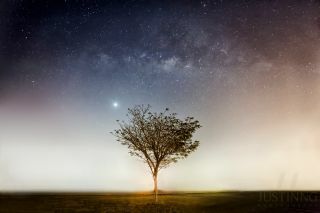 An avid night sky photographer proves the naysayers wrong with this "impossible" single-exposure image and video of the Milky Way and bright planet Venus rising over the light-polluted skies of Singapore. "My dream to capture the beautiful Milky Way galaxy in Singapore has finally come true this morning after the monsoon season is over," night sky photographer Justin Ng told Space.com in an email. He captured this single-exposure shot on Feb. 28, 2014 at 6:11 a.m. local time. "Singapore is known for its heavy light pollution and many people believe that it's impossible to shoot stars and Milky Way in Singapore." Ng made a video of the Milky Way and Venus over Singapore as proof of the feat. "This image aims to prove the popular belief wrong and I hope to inspire more astrophotographers residing in heavily light polluted cities to try to capture these 'impossible' images," Ng said.